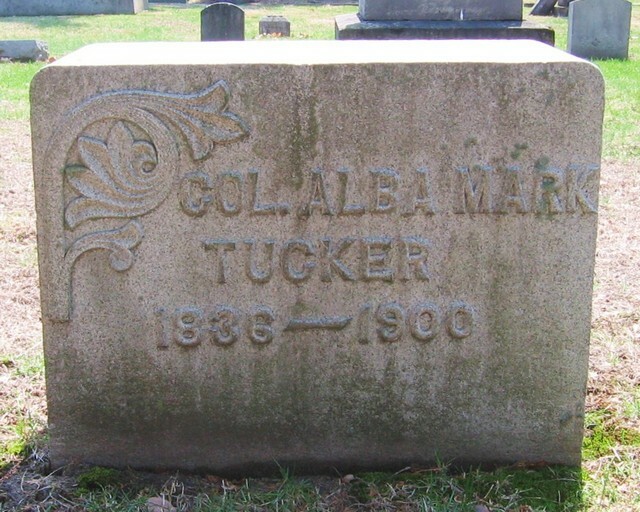 Col. Alba Mark Tucker died at a private sanitarium at Flint, Mich. At 6 o'clock yesterday morning. He was one of the best known, and at one time one of the most prominent citizens of Elkhart County. He was born in West Hartford, Vt., Nov. 14, 1836. He entered the railway service when but fourteen years old, and after serving as ticket agent for the Lake Shore and Michigan Southern, at Tecumseh, Mich., went to Elkhart as ticket agent when eighteen years old. He held other positions of greater importance with different roads until the Civil War, when he enlisted as a private in the One-Hundredth Indiana. He was made regiment quartermaster, and later became post quartermaster and commissary at Indianapolis. In 1863 he he became acting quartermaster at Memphis and was transferred to Louisville in October the same year, being at one period of the war distributing quartermaster at that city. He was auditor of Elkhart County in 1867-75, and subsequently mayor and then postmaster of Elkhart. He was assistant superintendent of the Michigan division of the Lake Shore from 1878 to 1885, and superintendent of the western division of the New York, Pennsylvania, and Ohio from 1885 to 1887, superintendent of the Mahoning division of the same road in 1888, general superintendent of the Chicago and Erie 1891, general manager of the New York, Pennsylvania and the Ohio, and the Chicago and Erie from 1891 to 1895. He was also a director of the Chicago and Erie, the Chicago and Western Indiana and the Belt Railway at Cleveland. and general agent of the Erie and Cleveland, which was the last office he ever held, illness compelling his retirement in 1895. He left three daughters. The burial will take place at Elkhart, but the time has not been determined.